Weather patterns have been variable in recent years, to say the least. After two relatively mild winters, the winter of 2013-2014 has started out more winter-like than has been customary. The previous few winters have been characterized by fluctuating winter temperatures, such as long warm periods followed by sudden deep chills, and these conditions are very detrimental to many plants. This pattern last winter resulted in severe damage to shrubs such as Hydrangea and Aucuba, which had set forth tender new growth during the lingering warmth through late winter, but were severely frost-burnt by the dramatic dip in temperatures in late March. Protect Young Plants from the Cold. Should warm weather occur later this winter, it could cause early new bud growth on such shrubs. 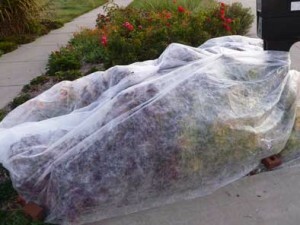 If so, you should monitor the weather forecasts, and if dramatic low temperatures with frost are predicted, it would be sensible to cover the most affected plants (e.g., Hydrangeas) during such nights (using row covers, or simple bed sheets). Regardless, most shrubs thusly damaged last winter recovered nicely in the spring, particularly if simply left alone, despite their wilted appearance, until the temperatures warmed up. In Case of Snow…. If we do have prolonged heavy snowfalls, it is important to check on any fragile shrubs and trees that could be harmed. Newly installed plants are particularly delicate and susceptible to damage from heavy snow. If there should be a lengthy snowstorm, periodically – e.g., every few hours – it would be wise to go outside and brush snow off of shrubs and trees (yes, even though trees look nice with snow covering their branches). You can also shake plants to dislodge snow. It is best to use a broom and sweep the snow lightly upwards off of the branches, starting at the top of the plant and working down. Remove Snow from Evergreens. Broadleaf evergreen shrubs are most susceptible to heavy snow damage (e.g., Nandina, Rhododendron, Mahonia, Viburnum, Pieris, Boxwood, Japanese Holly, Cherry Laurel, Azalea, Euonymus, Aucuba, etc.). 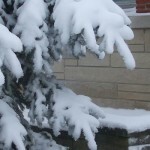 Conifers — such as Yew, Juniper, Falsecypress, Arborvitae, and Cryptomeria – are a bit hardier, but still can suffer branch breakage from the heavy snow that accumulates particularly at the top of the plant. 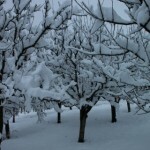 In fact, if tall, such plantings can be bent down to the ground by heavy snow, and it is imperative to ‘release’ them. Otherwise, the bark can be damaged from the stress of the snow. They may be crooked after being released, but they should straighten in the spring. They should be viable if addressed quickly rather than letting the snow remain and damage them. If they are young and fragile, it is worth tying them to stakes or fencing temporarily to help straighten them. Particularly vulnerable specimens might benefit from some physical support prior to the onset of winter, particularly if heavy snowfalls are predicted. Leave Ice Alone. If shrub and tree branches are covered by ice, rather than light snow, then it is best to leave that until it melts, because small branches could easily be broken by efforts to dislodge the ice. Freezing and Thawing Cycles. Alternative freezing and thawing can also harm perennials. This can cause plants to heave out of the ground, leaving roots exposed, causing damage or death to plants. If it becomes very cold and snowy, plants should be inspected after temperatures moderate above freezing. If you see any plants that appear to be lifted above the ground with roots exposed, you should try to temporarily fix this by digging up some soil and placing it around the base of affected plants to cover the roots. Later on – late spring – it may be helpful to dig out such plants and reinstall them deeper into the ground. A good layer of mulch should protect against this occurrence. Enjoy the beauty of snow in the landscape. But as you head out to shovel your walkway or blow the snow off of your driveway, don’t forget to sweep the white frosty covering from your precious plantings to protect them for seasons to come.